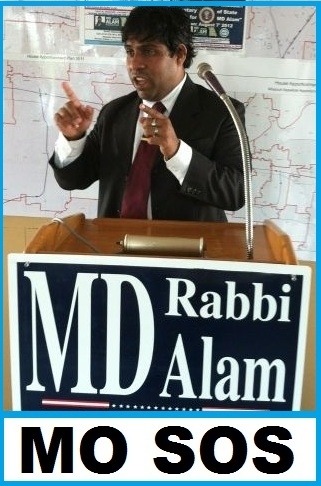 MD Rabbi Alam, A Democrat to Watch? According to a report by Adam Kredo, Alam is "an Obama campaign ally and Missouri-based Democratic activist who chairs the National Democratic Party Asian American Caucus (NDPAAC), a Democratic National Committee-sponsored organization that liaises with Asian minorities." He's also president of the North American Bangladeshi Association for Bangladesh, "a non-profit Educational based organization working closely with the US Department of Education," as well as a candidate for Missouri secretary of state. Oh, and he's "a 9/11 Truther who has associated with a radical Muslim cleric and trafficked in anti-Semitic conspiracy theories." MD Rabbi Alam's campaign poster of the secretary of state position in Missouri. Alam, who was born in Bangladesh, served as a "satellite campaign manager" for then-candidate Barack Obama and the Democratic Party during the 2008 elections, and has since been invited to the White House. Alam has speculated about Jewish involvement in the September 11th terrorist attacks and participated in an event with a Muslim cleric who has accused Israel of terrorism and alleged that the U.S. invented the HIV disease. Alam is also on record decrying the arrest of Sami Al-Arian, a Muslim activist who pled guilty to soliciting money on behalf of Palestinian Islamic Jihad, which had been designated a terrorist group committed to Israel's destruction. "Who does not know about Dr. Arian, a Florida university professor falsely accused and victimized by [the] war on terror?" Alam asked in a 2009 video recorded for the Islamic Society of Greater Kansas City. Sep. 6, 2012 update: Jason Kander, a member of the Missouri House of Representatives and a member of the New Reform Temple, defeated Alam to run as the Democratic candidate for Missouri secretary of state. Jan. 5, 2013 update: In a debate with me on Press TV, the Truther-conspiracy theorist Kevin Barrett praised Alam: "Thank God there are a few brave men like MD Rabbi Alam, the high-level democratic politician from Missouri who is standing up for the truth." Turns out, Barrett is national communications director of AMPAC. June 5, 2013 update: AMPAC plans a "Million Muslim March" on Washington on Sep. 11, 2013. Join AMPAC on a Historic Moment on 9/11/13 for Establishing the Humanity and Justice through Civil Rights Movement. We at AMPAC (American Political Action Committee) are planning an historic event for 9.11.13 where one million Muslims will march to Washington D.C. and demand that our civil rights be protected by our government. We are demanding that laws be enacted protecting our 1st amendment . We are asking President Obama to fulfill his promise from his first campaign for Presidency of a transparent government. Lastly we are asking for the release of the 9/11 commission report to the American people. On 9.11.01 our country was forever changed by the horrific events in New York. The entire country was victimized by the acts done on that day. Muslim and Non Muslim alike were traumatized but we as Muslims continue 12 years later to be victimized by being made the villains. To this day every media outlet and anti Islamic organization has committed slanderous and libel statements against us as Muslims and our religion of Islam. These lies told to the American population has made it impossible for us to do true Dawa. Why do we have to defend our religion while doing Dawa? Why can't we just share the perfection of the Quran and the beauty of our beloved Prophet Muhammad (SWS)? It is time for us as Muslims in America to stop being defensive and start being proactive by using our right to vote and our freedom of assemble and let our voices be heard by our country and the world. Stand with us help us fight the injustices being committed against us. Comments: A million Muslim conspiracy theorists on the march? This should be interesting to watch. Aug. 16, 2013 update: Fox News has discovered the AMPAC demonstration planned for Sep. 11. It notes a change in name from the "Million Muslim March," to "Million American March Against Fear," then an apparent reversion back to the original title. In an interview with Sean Hannity, M.D. Rabbi Alam claimed demonstrators will on that day "show America that we Muslims denounce terrorism." But Zuhdi Jasser of the American Islamic Forum for Democracy called the organizers "basically a bunch of 'truthers' who think that America's to blame for everything," and quoted The Anti-Defamation League as identifying some of the leaders as "virulent, anti-Semites who think 9/11 was a conspiracy theory." Aug. 21, 2013 update: Zuhdi Jasser's American Islamic Forum for Democracy has noted that one of the speakers at the march is from the Council on American-Islamic Relations, or CAIR, revealing yet again the true nature of this reprobate organization. Sep. 11, 2013 update: Not a million but maybe a hundred turned up for the "Million American March Against Fear." May 1, 2015 update: You got to say this for ole' MD Rabbi Alam: He does not give up easily. Today he announced his campaign to be elected to the U.S. Senate in 2016. His announcement features a picture of him in uniform carrying an assault rifle.